Our 35th awardee celebrates the partnership of the Penn State Master Gardener Program, local Pittsburgh artists, and Rivers of Steel. The Iron Garden Walk interprets the interplay between wild gardens and a living laboratory, and explores the ideas of sustainability at the Carrie Furnaces, located in Rankin, PA. The partners have created interpretive cast iron plaques that tell an interactive narrative to the wild gardens that have overtaken the former industrial site. This project harkens back to the original use of the blast furnace and the role of cast iron in our region. The $1,000 grant supported the creation and installation of the stands for the cast iron plaques. The plaques were created with input from the Master Gardeners and a multi-disciplinary team of professionals and volunteers from science, art, history and industry. The result is a series of twelve cast iron plaques that will lead visitors on a guided tour of the wild gardens in 2015. “The Iron Garden Walk at the Carrie Furnaces illustrates the evolution of a derelict blast furnace into a cultural and historical landmark. With the installation of the interpretive plaques, visitors to the site will be able to understand the reclamation of the area by nature and how it has contributed to the overall renaissance of the Carrie Furnaces. For years, it was thought that nothing would ever grow at the furnace and it has since become a refuge for plants and animals, as well as a gathering space for those who celebrate its place in history and in the future,” explains Evelyn Castillo, one of Awesome Pittsburgh’s newest trustees. 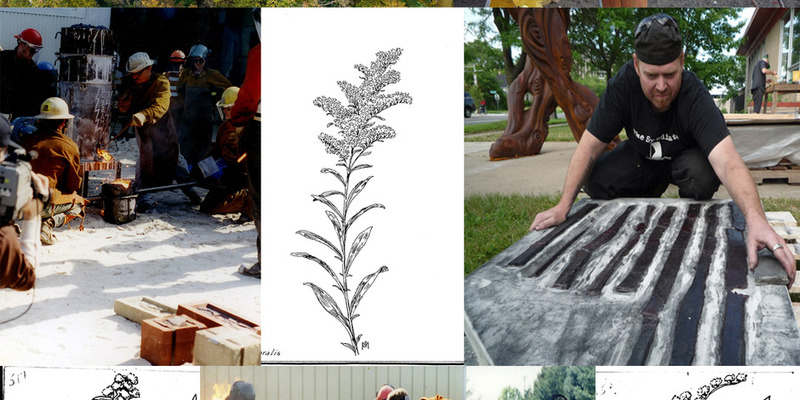 The cast iron plaques, created during the October event “Carrie Furnaces Iron Pour” will include botanical illustrations of the local plant community that highlight identifiable features such as bark, fruit and leaf. The plaques’ three-dimensionality allows visitors to take rubbings with charcoal and paper.